Generally it is assumed that regional accessibility is important for the economic and social opportunities of a location or a place. Recent research on agglomeration economies suggests that economic growth, labour migration and accessibility are closely interrelated in reality. However, around 1/8 of the European regions have a high GDP per capita despite a low accessibility. Apparently these less accessible regions found other ways to overcome deficits of low accessibility and reached a good economic welfare. 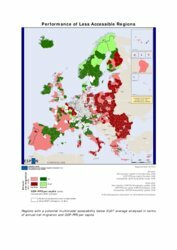 This ESPON ‘Map of the Month’ focuses on less accessible regions in Europe, i.e regions with a potential multimodal accessibility in 2006 below the EU average. The diversity of these regions is examined by analysing the GDP-PPS per capita in 2006 and the annual net-migration for 2001-2005. Please note that the latest data available display the situation in 2006. Consequently, this map does not reflect any effects of the recent global economic downturn. Three factors are combined in this map: accessibility, economic welfare and net-migration. Potential accessibility describes how easy people in one region can reach people located in other European regions. It is calculated based on two elements: population in NUTS 3 regions and the effort (time) to reach them. The accessibility model used by ESPON (1) measures the minimum travel time between all NUTS 3 regions. In this case, multimodal accessibility is used, integrating the accessibility by road, rail and air into one indicator expressing the combined effect of these modes for each NUTS 3 region. GDP-PPS per capita is used as indicator for economic welfare. GDP-PPS is the gross domestic product (GDP) per power purchasing standard (PPS) where PPS takes into account the relative cost of living and inflation rates. This makes it possible to compare the indicator between countries. This indicator is then divided by the total population in the region (NUTS 3). Net-migration in 2001-2005 shows the annual change in net-migration in the period between 2001 and 2005. Net-migration corresponds to the difference between in- and out-migration. If net-migration is positive, more people have migrated into the region than moved out of the region. Finally, in order to compare the territorial profile of less accessible regions, the net-migration and the GDP-PPS per capita are both divided into two classes: In- and out migration and respectively, above and below EU average GDP-PPS per capita. The resulting map shows the less accessible regions of Europe classified in four categories according to their economic and demographic profiles. Almost 1/4 of the regions with low accessibility (24%) perform above average on GDP and are in-migration areas. The majority of these regions (dark green) can be found in the Nordic countries and regions close to central areas in Europe with good accessibility mainly in Italy and France. But also Ireland, Iceland, and Northern Spain consist primarily of regions with a positive performance on GDP and migration. More than 2/5 of the low accessible European regions (41%) are in-migration regions despite a GDP below EU average (light red). Regions that share these characteristics are situated mainly in Portugal, Spain, France, Slovenia, Greece, Malta, Cyprus, Hungary, United Kingdom and Estonia. Apparently these regions have other factors than good accessibility and economic welfare to attract people. One of these factors may be the presence of attractive climatic conditions. Only 5% of the regions (light green) with low accessibility and above average GDP per capita are out-migration areas. This type of situation occurs in remote regions in the North of Scandinavia and in areas with declining industries such as the North of France. The low share in this category of regions could indicate that GDP is more important for people than accessibility. Almost 1/3 of the low accessible European regions (30%) perform also below average on economic welfare and experience out-migration (dark red). These regions are mostly situated in Eastern Europe, but can also be found in Southern Italy, middle of Greece, and North-East of France. Regions surrounding capital cities in Eastern and Southern Europe are in a better position than other regions as they experienced in-migration. This situation appears in Sofia, Bucharest, Budapest, Rome, Ljubljana, Madrid, Lisbon, Bratislava and Riga and could indicate that sub-urbanisation is taking place. Only 1 out of 4 regions with low accessibility experience economic success as well as in-migration. Large clusters of regions in Eastern Europe face both economic and demographic challenges as they have below EU average GDP together with a negative migratory balance. Regions in Western and Southern Europe mainly located in Southern Spain, Portugal and France, reveal to be attractive areas for living despite the fact of having below EU average GDP. The best situation can be found in regions in the Nord (Norway and Sweden), Ireland, as well as in some regions scattered in France, UK, Northern Italy and Spain. 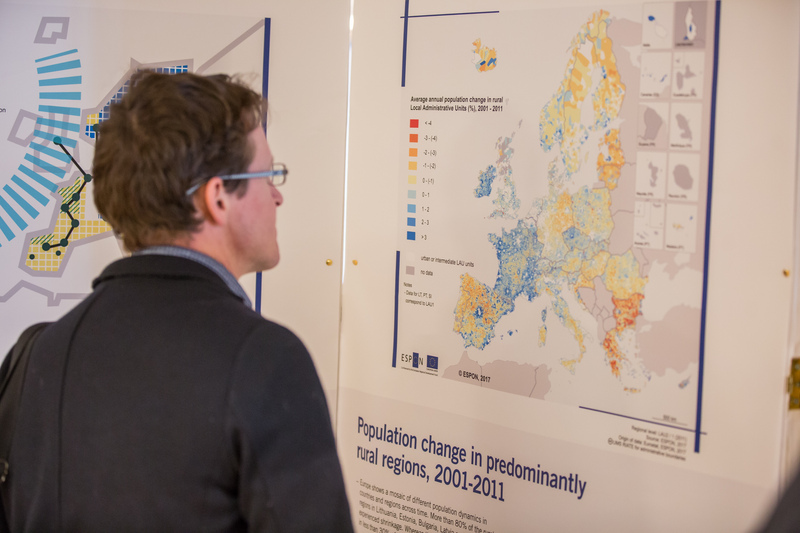 These low accessible regions revealed to be successful regions both in demographic and economic terms as they have above EU average GDP and a positive migratory balance. Please keep in mind that transport infrastructure is not the only lever to create economic success. A more balanced, integrated approach towards creating economic growth is needed including a policy mix tailored to the regions potentials. European regions with low accessibility that are attractive and economically successful should inspire less accessible regions that do not perform equally well. Further reading: ESPON Territorial Observation No 2. (1) Based on Spiekermann and Wegener, 1996.